See You at the Supersale Mid Year Bazaar! ...well, hopefully, if I get enough likes. So help me guuuys. Hehe. It won't take 2 minutes I promise! And while you're at it, like the other bloggers photos too:) I wanna be there with them! Like my photo HERE! Click click click. Get ready for this year’s SuperSale Bazaar Mid Year Season Sale on July 13-15, 2012 at The World Trade Center from 10am-9pm. A gathering of your favorite local designer brands from clothes to shoes to accessories like Abby Jocson, Moonshine, Celline, Glitterati, School of Satchel, Queen Street, Sole Service, Posh Pocket Shoes, S&H, Gold Dot, Das My Shoes, The Souq Intl., I love Koi, Soak Swimwear, Apartment 8, Eight One, and Digital Train Case. The list doesn’t stop there, make way for the new upcoming brands to help you spruce up your wardrobes like MADE jeans, Tocande, Tutum Shop, Heliana, Flying Dutchman, Rolu and Satchi, Saint Rebel, Erb and Chet, Vishoes, Toni and Berne, Flutter, Satchmi, Tsunami Swimwear, Pirouette, Cultus Couture and more! For the Benefit of World Vision, helping build a better world for children. 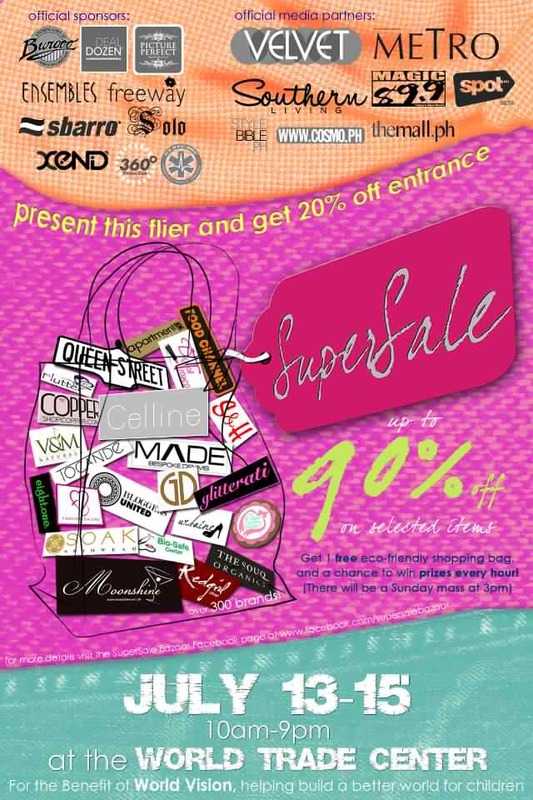 For inquiries, please call +63917-8013772, emailsupersalebazaar@yahoo.com or visit http://www.facebook.com/supersalebazaar.